3 Bedroom 3 Bath, Loft And Basement Log Home Close To Lake Barkley. 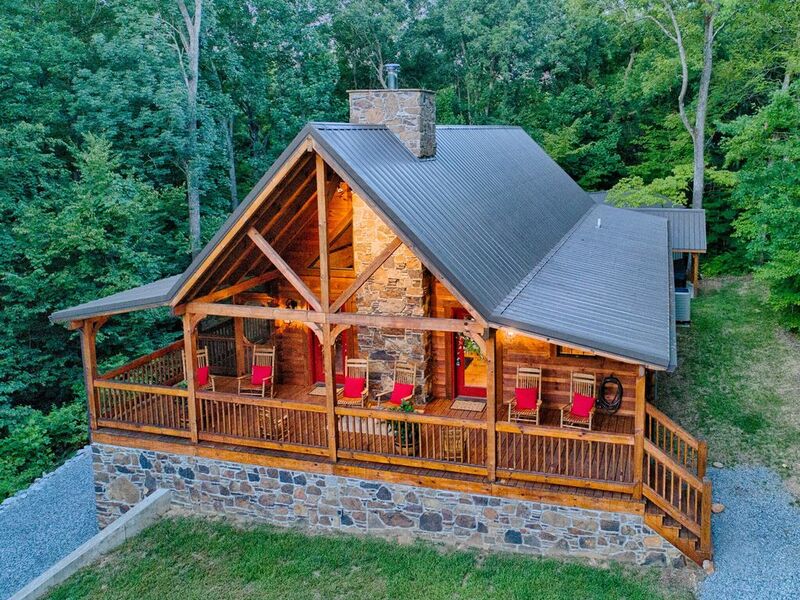 This home is a new construction log home, beautifully decorated to make you feel at home. This 3 bedrooms 3 bath home has a lot to offer. Master Bedroom and Master Bath located on the main level. Bedroom 2 located in loft area with beautiful view of the living area. The 3rd bedroom is located downstairs with its own living area, bathroom and laundry room The home is also equipped with a custom built laundry chute making hassle free laundry. Kitchen has all new stainless steel appliances as well as granite counter tops. Breakfast bar area for meals as well as small dinette table and chairs. Master bathroom has ceramic tiled shower and whirlpool tub. This home also offers a large screened in porch area with TV. The front deck also offers an area for family and friends to gather and enjoy the beautiful Kentucky sunsets. The ground floor patio area also offers the 3rd area for grilling and relaxing. Home offers a 6 person hot tub under a covered gazebo. This home is located close to public boat ramp and has use of 1 community boat slip for renters. We will decorate for holidays as request. This home also has a space for an RV with Electric, Water, and Sewer. This space is rented with the home for an additional fee. This space is not rented separately from the home. UTV's and golf carts only, no forwarders allowed. No hoverboard allowed. community boat slip available, ATVs and UTVs are welcomed here for access to the area. This home does offer a ground level entrance at the basement without any steps. Renters will have access to 1 boat slip on community boat dock. Home has additional space for RV with hookups. Will not be rented separately from home. Ask for details and rates. ATVs and UTVs are welcomed here to access and enjoy the area. This was a fun little getaway for our family. The cabin was absolutely gorgeous! We were super impressed with how comfortable the beds and the couch were. It was fully stocked with the best towels, sheets, pillows, extra blankets, cookware and appliances. They even had bodywash and hand soap in every bathroom. Super nice washer and dryer which was so handy to wash our clothes. They even had laundry essentials and every cleaning product you might need. We also loved all of the TVs through out the cabin. It came in handy with our children. It really made us feel like we were at home. The hot tub, fire pit and the screened in porch were amazing features to this cabin as well. We will definitely be back to this cabin. I would highly recommended this place!! This cabin lives up to the photos! Beautiful woodwork, spacious layout, comfortable bedrooms, well-appointed kitchen. Stayed here for 4 nights in early April with my mom and sister, and it made a great home base for exploring the region. It was a little early weather-wise for enjoying all the lake-related activities but we found plenty to do in Paducah, Cadiz, and Hopkinsville. Would love to come back in the summer warmth and enjoy the larges porches, hot tub, and the lake itself a little more. Highly recommend this rental! Owners are very friendly and easily reached if any issues. Very clean and well kept place, the land between the lakes is worth visiting. This was such a great place to relax. We were there the week of Thanksgiving and we had a pecan pie waiting for us when we arrived and the cabin was decorated for the holidays. We have stayed in several cabins through the years and this one was more equipped with amenities than any of the others. It was so nice and quiet and the owner checked on us a couple of times during the week to see if we needed anything. Wonderful, Beautiful, Amazing Place to Vacation! My family had a week-end get-a-way in this beautiful lake house! The house is private and beautiful! It was very inviting and cozy! It was stocked with anything we needed! We took groceries to the house and cooked our meals there and the kitchen had everything we needed and more! The beautiful lake was a short walk! The hot tub and fire pit provided extra opportunities to relax and enjoy ourselves! Grown ups and kids all loved it! April answered questions for me before we got there and Patty could not have been more helpful or accessible! I have rented many homes for vacation and Patty was by far the friendliest and most helpful!! She checked in on us via phone and was available for any questions. I feel like I have gained a new friend! This was a wonderful and relaxing vacation! We look forward to our next stay in this accommodating house! I highly recommend it! we loved it , home owner very nice sent us a cake for Our 40th Anniversary. Had wonderful time with kids had plenty of room. We all enjoyed the fire pit. Grandson loved the hot tub. Very clean home and very will maintained. We made wonderful memories. Located just minutes away from LBL Land Between the Lakes, Kentucky Dam and Barkley Dam. The contract will require all adults and children listed, any breach of the contract will give owner right to retain the deposit. All house rules and neighborhood regulations must be complied with by all renters. A boat dock waiver must also be signed. No same day check in's as check out's. A maximum number of renters in the home are 8, $25.00 additional per night per person for the 7th and 8th guest. Posted rates are for 6 guests (nightly, weekly).